If pressed, I would name Otello as my favourite of Verdi’s operas. It has magnificent music, well-developed characters, and, of course, a great story. Verdi was tempted out of semi-retirement to write it — it followed his previous opera, Aida, by a full sixteen years — and it is amazing to consider that not only had he lost none of his dramatic sense and musical inspiration in the interim but, if anything, both were keener than they had ever been. The music of Otello is especially impressive. The orchestration is richer and more textured than is typical with Verdi, and the seams between the arias and and the dramatic recitative have been concealed to a greater extent than in his earlier work. There is an expansiveness, a calm breadth in the music that is very seductive. The tragic sensibility which I admired in Simon Boccanegra is present in this opera too, but here it is wedded to a dramatic arc that is without superfluous elements or overly complex machinations, and it is all the more powerful as a result. This matter of adapting the play for the opera is worth commenting on. It is rare to find a drama that plays well both in the theatre and the opera house: there is no great operatic Hamlet or The Tempest, and few theatre-goers are lining up to see Beaumarchais’s Le Barbier de Séville or Sardou’s La Tosca. Opera is an art that works with big gestures, and is most successful when the stories are relatively clear and the characters relatively simple. This general observation highlights the skill with which Verdi’s librettist, Arrigo Boito, adapted Shakespeare’s play. I read that the libretto is just 1/7 the length of the play, yet it contains the essential action, and the central characters — Otello, Desdemona, and Iago — have faithfully inherited their personalities from Shakespeare’s originals. (Perhaps Iago in the opera is not quite so complicated as Iago in the play.) It is one of the best libretti in the repertoire. Later that evening, Otello and Desdemona are finally left alone to share a gorgeous love duet, Gia nella notte densa (Now in the dark night). It is sung in this clip by Placido Domingo (again) and Anna Netrebko in a concert performance with English subtitles. In Act II Iago has a very famous aria, Credo in un Dio crudel (I believe in a cruel God), a kind of malicious manifesto in which he gives full vent to his nihilism and self-hatred. Iago in this opera is truly a monster — exaggerated for effect beyond what one could attribute even to Shakespeare’s Iago. In this clip we hear Piero Cappuccilli in an old, fuzzy film, with subtitles. This looks a bit corny; try to squint. The fourth and final Act, set in Desdemona’s bedchamber, is as good as opera gets. Desdemona sings a long, unbelievably beautiful section: first the “Willow Song”, and then, as she prepares for bed, Ave Maria. These are among the most celebrated soprano arias in the repertoire. Here is Marina Poplavskaya singing the “Willow Song”; the subtitles are unfortunately in German, but the text with English translation can be seen here. And here is the same singer with the Ave Maria section; German subtitles again. The text is not the traditional prayer, so you may wish to consult the English translation here. Soon enough Otello enters the bedchamber and accuses Desdemona of unfaithfulness. The ensuing scene, in all its tragic glory, is quite long but superb; it is the tail-end of the “long diminuendo“. I have had to split it into two parts: in the first, Otello is sung by Placido Domingo and Desdemona by Renee Fleming; there are English subtitles. The second excerpt picks up where the previous one left off, except that Renee Fleming has been replaced by Barbara Frittoli and the English subtitles have disappeared. It is the best I can do. It was also, I dare say, just about the best Verdi could do. It has now been well over a year since I finished reading this great tetralogy. I have been putting off writing about it until I could find time and space to write something that would “do it justice”. But it is fairly evident that that time and space are not going to be found anytime in the near future or in this neighbourhood, so here I am, resigned to pecking out something inadequate but appreciative. Some spoilers follow. The books tell the life story of Olav Audunssøn, a fourteenth-century Norwegian landowner. Olav is a Catholic, and much of the drama of the story is driven by the conflict between the moral vision of the Church, rooted in mercy, repentance, and forgiveness, and the traditional moral vision of the Scandanavian people, rooted in honour, reputation, and vengeance. Olav feels the demands of both moral systems in a very acute way, and he is crushed at the place where they press against one another. In the first volume of the tetralogy Olav commits a murder. It is done for the best of reasons, so to speak, in order to defend his wife’s honour (and his own), and he does it without anyone knowing, or even suspecting, that anyone has died. He gets away with it, and he must keep it secret — not so much for civil reasons, for according to the honour code the murder was defensible, but because he cannot reveal his motive without revealing the shameful secret which the murder was committed to avenge. Yet Olav’s conscience torments him, and his unwillingness to repent begins to harden his heart. His unwillingness to confess begins to disrupt his relationship to the Church. He twists and turns, rationalizing his acts. All the while he senses that Christ pursues him, offering grace which Olav refuses. “I thought I could not live if another had stained my honour and I let it go unavenged,” he says. “I thought it easier to live besmirched if I myself had stained my honour — so long as none knew of the stain. For such a cause as this I turned Judas against my Lord, armed me with the hardest sins, if but they might be hard enough to weigh upon my weakness like an armour.” The heart of the story, across all four books, is about how this internal struggle plays out. It is told with nuance and sensitivity, moral wisdom, and, I am convinced, love for Olav and sympathy with his predicament, in which he must suffer if he does not confess, yet also suffer — and not just him, but his family also — if he does. Olav lives a long and eventful life; we travel with him to England on a commercial venture, and he joins his countrymen in a war against invading Danes. He is, in many significant respects, a good man: respected, magnanimous, protective and supportive of his family, willing to suffer for the good of others. Everything he does and sees is absorbed by his inner turmoil, casting it in new light or new shadow. He has moments of spiritual clarity (“But now he tardily understood that then he must choose, not between God and this or that upon earth, not even his worldly life, but between God and himself.”) but his general trajectory is one of growing hardness and reluctant resistance to grace. “His soul was grey and cold as a corpse,” we are told in the final volume. Yet Olav’s God is one who can raise even a corpse to new life. The offer of mercy is never foreclosed. After his death, his son and daughter, even after learning of the great sin which had cast its long shadow over this life, call him “an upright man” for all the steady good he did them throughout his life. And he did more than they knew. Readers of Undset’s more famous Kristen Lavransdatter trilogy might be amused to learn that Kristen’s parents make a brief appearance in these books. The two stories are quite closely related, and are, I am tempted to say, of comparable stature as literary achievements. I expect that her Nobel Prize for Literature was awarded chiefly on the strength of these two books. This English translation of The Master of Hestviken, by Arthur G. Chater, is serviceable; early in the first volume it is unpalatably sweet and somewhat stilted in its efforts to sound antiquated, but it improves as it goes. It is highly recommended nonetheless; there are no other options. As I remarked yesterday, today is Benjamin Britten’s 100th birthday. It is also, of course, the Feast of St. Cecilia, patroness of musicians. Let’s celebrate them both with Britten’s Hymn to St. Cecilia; the poetry is by Auden. Tomorrow will be the centenary of Benjamin Britten’s birth, and to mark the occasion I thought it would be enjoyable to highlight a few of my favourite recordings of his music. The selection criteria for this list are vague, but basically I am thinking of a combination of great music wedded to superior performances and recording technique. It so happens that all of the recordings I have chosen are of choral or vocal music. Britten did write music for instruments alone, and some of that music — his cello suites, for instance, or his Young Person’s Guide to the Orchestra — is excellent, but it is fair to say that music for voices is at the center of his art, so the lopsidedness of my favourites is not too misleading. I suppose I should have included some opera. Britten wrote most of his music for tenor voice specifically for his partner Peter Pears, and Pears made many recordings which, by the very nature of the case, enjoy a rare authority, and, for some listeners, put other singers at a disadvantage in this repertoire. 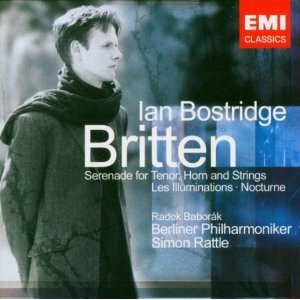 But I am one of those who have never warmed to Pears’ distinctive timbre, and to my mind it is Ian Bostridge, the young English tenor, who is the greatest interpreter of Britten’s songs. Bostridge is that rarest of creatures: a singer with brains. Almost without exception, his way with Britten’s music is outstanding; in fact, there is a sense in which my admiration of Britten himself is bound up with my admiration of Bostridge, so ideally matched do they seem to be. His voice is light and agile, and he delivers these wonderful songs with clear articulation and attention to detail. 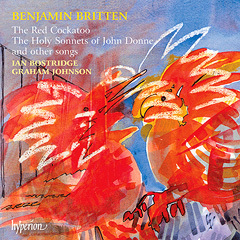 At the center of the programme of this disc are the Holy Sonnets of John Donne, which are rarely heard but rank with Britten’s finest work. They are supplemented by a variety of shorter pieces, setting poetry of Auden and Blake, among others, and it is all superbly done, with ideal accompaniment from Graham Johnson at the piano. 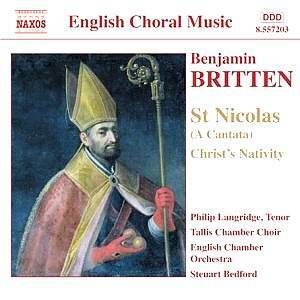 Britten wrote a great deal of music for Christmas, and although his church cantata St. Nicolas is probably a fairly minor work in his canon, this recording of the piece is so wonderful that it earns a place on my list. The piece was written in 1948, and was one of many which Britten wrote for amateur performers (although the tenor part in St. Nicolas is for a professional). The St. Nicolas whose life is rehearsed over the course of the cantata is not the jolly “St. Nick” who now dominates the Christmas season, but the historical figure, Bishop of Myra, filtered through the conventions of early Christian hagiography. Nicolas springs from his mother’s womb early in the piece with a triumphant shout of “God be glorified!”, and the music continues from there, portraying his life of charity, his journey to Palestine, his appointment as bishop, his miracles, and his death (“I bless Thy name, who lived and died for me, and, dying, yield my soul to Thee.”). The piece is a rare union of substantive piety and good humour, with a score that crackles with lively energy. In this recording, which is very atmospheric and brings the listener right into the performance space, the part of the narrator is superbly sung by Philip Langridge, and Steuart Bedford, who knew and worked with Britten, leads the polished (but not too polished) forces in what makes for a treasurable recording. 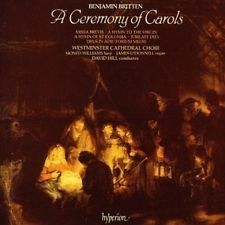 A Ceremony of Carols may be Britten’s most popular collection of Christmas music, and this is a great recording of it. Britten wrote it in 1942 as he was crossing the Atlantic, returning home from America. I don’t know what time of year he made the crossing, but the music gives every impression of having been written in the soft glow of candles, at the foot of a Christmas tree, beside a creche, with a wreath of mistletoe and a glass of hot cider on the table. It has that special Christmas quality: both hushed and joyous at once. The piece is written for treble choir and harp, which gives an idea of its intimate scale. It consists of ten or so short carols to Middle English texts, framed by a processional and recessional based on the Gregorian proper “Hodie, Christus natus est”. This recording, made at Westminster Cathedral with the boys’ choir, nicely captures the spatial aspect of the performance, as the choir enters at the beginning and departs at the end, but it is the singing in the meantime that really stands out. There is an excitement and enthusiasm in the sound, as though this choir of angels is bursting at the seams for sheer joyous exuberance, and there is an unusually vivid immediacy in the recorded sound. I come back to this recording every Christmas, and my admiration for it never fails. Also on the programme are a number of shorter works, including a very fine rendition of Britten’s early masterpiece A Hymn to the Virgin, which I occasionally try to sing to my children at bedtime (though I am invariably interrupted by earnest petitions that I stop). 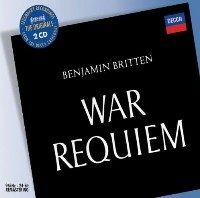 Anyone else care to recommend a favourite recording of Britten’s music? Or just a favourite piece? Part of the reason that I’ve not yet sat down with Ms. O’Connor is that I’ve been preoccupied with David Bentley Hart’s most recent book, which I also mentioned a while ago; that’s it on the right. 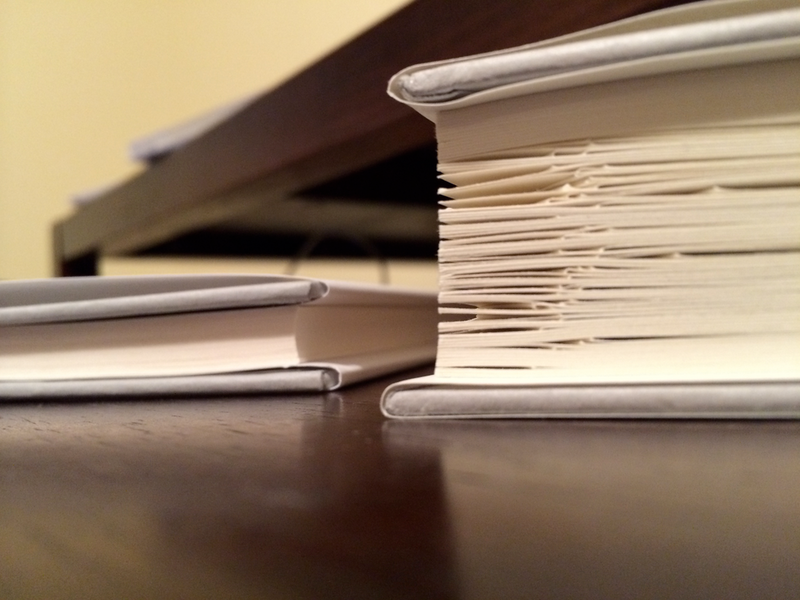 When I read I have a habit of turning down the corners of pages that contain a passage I’d like to return to. Clearly, I am enjoying this book. This means something different, but not quite different, from modern English solemn. Like solemn it implies the opposite of what is familiar, free and easy, or ordinary. But unlike solemn it does not suggest gloom, oppression, or austerity. The ball in the first act of Romeo and Juliet was a ‘solemnity’. The feast at the beginning of Gawain and the Green Knight is very much of a solemnity. A great mass by Mozart or Beethoven is as much a solemnity in its hilarious Gloria as in its poignant crucifixus est. Feasts are, in this sense, more solemn than fasts. Easter is solempne, Good Friday is not. The Solempne is the festal, which is also the stately and the ceremonial, the proper occasion for pomp – and the very fact that pompous is now used only in a bad sense measures the degree to which we have lost the old idea of ‘solemnity’. To recover it you must think of a court ball, or a coronation, or a victory march, as these things appear to people who enjoy them; in an age when every one puts on his oldest clothes to be happy in, you must re-awake the simpler state of mind in which people put on gold and scarlet to be happy in. Above all, you must be rid of the hideous idea, fruit of a wide-spread inferiority complex, that pomp, on the proper occasions, has any connexion with vanity or self-conceit. A celebrant approaching the altar, a princess led out by a king to dance a minuet, a general officer on a ceremonial parade, a major-domo preceding the boar’s head at a Christmas feast – all these wear unusual clothes and move with calculated dignity. This does not mean that they are vain, but that they are obedient; they are obeying the hoc age which presides over every solemnity. The modern habit of doing ceremonial things unceremoniously is no proof of humility; rather it proves the offender’s inability to forget himself in the rite, and his readiness to spoil for every one else the proper pleasure of ritual. — A Preface to Paradise Lost. Sir John Tavener died today in Dorset. For some decades he has been counted among England’s leading composers, usually lumped with the “holy minimalists” by those with a liking for such labels. He did write a great deal of sacred music, little of it for liturgical purposes and much of it quite beautiful, though sometimes sullied by what was, to my mind, an overzealous religious syncretism. His best known compositions are probably his marvellous setting of Blake’s “The Lamb”, and his “Song for Athene”, which was sung at Princess Diana’s funeral. I am fond of his cello concerto in honour of Our Lady, The Protecting Veil, which is, however, too long to post here. Instead, here is his Hymn to the Mother of God, in whose tender keeping I hope he now finds himself. Oh, why not? Here is a lovely section of The Protecting Veil, with Yo-Yo Ma at the cello. Part of the fun of revisiting Britten’s operas this anniversary year has been to see whether my previous opinions — sometimes formed on slight acquaintance — are confirmed or upended. As I wrote a few weeks ago, I was disappointed to be disappointed by The Turn of the Screw, which I had thought I would enjoy more than I did. But then here comes Britten’s operatic setting of A Midsummer Night’s Dream to restore the balance: I had thought (based on a live performance I saw about ten years ago) that it was a pleasant but fairly peripheral work, but now, after spending time with a few recordings, I am close to bursting with enthusiasm. Well, at least I find it to be much better than I had remembered. The piece had its premiere in 1960; Britten himself, with Peter Pears, adapted the piece from Shakespeare, and the libretto is fairly faithful to the beloved original, right down to individual lines. Britten does superb work providing distinctive musical backdrops for the three principal groups of characters: the fairies, the lovers, and the rustics. If I am not mistaken, this was Britten’s only operatic comedy (unless I count the early quasi-opera Paul Bunyan), and the wit comes through brilliantly, especially in the Pyramus and Thisbe section. As the story is known to everyone, let’s move directly to some musical highlights. Sad to say, but there are only a few video clips available on YouTube; this makes my work easier, but I am not convinced these slim pickings will really allow me to convey the charm of the piece.